These recycled glass birds illuminate your garden at night. Like the feathered friends that visit your back yard, these illuminated garden stakes by glass artist Stephen Kitras add bright beauty to any outdoor space. Each 100% recycled glass bird brings enchantment to your yard, patio, or garden by day and, with the help of the sun's rays and a small solar panel, lights up at night. The sweet, hand-blown birds conceal a light that complements the artist's gestural details and splashes of rich color. Handmade in Canada. Clean glass and stand with a damp cloth- do not submerge in water. Can be left outside year round. To secure, hold the stake and push 4"-5" into the ground. Do not push on the glass globe. Light lasts about 6-10 hours after full 8 hour charge. 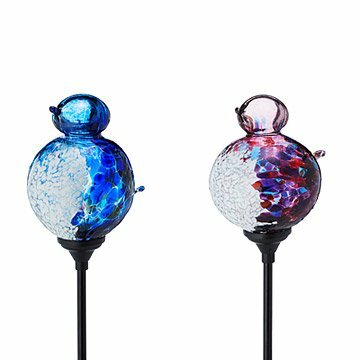 These Solar Bird Globes are being used to light the walkway and entrance to my mother's garden. They are the perfect size to blend into the surroundings and provide a little treat when discovered among the flowers. They emit a soft light when in use that adds a special touch to my mother's favorite spot. This little bird light is so cute! It was easy to put together and after a few hours in the sun, the solar charger was able to light the small bulb. The glass bird is so beautiful and I'm happy to have this little fellow in my garden. Definitely a lovely gift for your gardening friends.